Shell is an innovation-driven global group of energy and petrochemical companies. Upstream International manages the Upstream businesses outside the Americas. It explores for and recovers crude oil, natural gas and natural gas liquids, liquefies and transports gas, and operates the upstream and midstream infrastructure necessary to deliver oil and gas to market. Upstream International also manages Shell’s LNG and GTL businesses. Since January 2013, it manages its operations primarily by line of business, with this structure overlaying individual country organisations. This organisation is supported by activities such as Exploration and New Business Development. Previously activities were organised primarily by geographical location. Upstream Americas manages the Upstream businesses in North and South America. It explores for and recovers crude oil, natural gas and natural gas liquids, transports gas and operates the upstream and midstream infrastructure necessary to deliver oil and gas to market. Upstream Americas also extracts bitumen from oil sands that is converted into synthetic crude oil. Additionally, it manages the US-based wind business. It manages its operations by line of business, supported by activities such as Exploration and New Business Development. 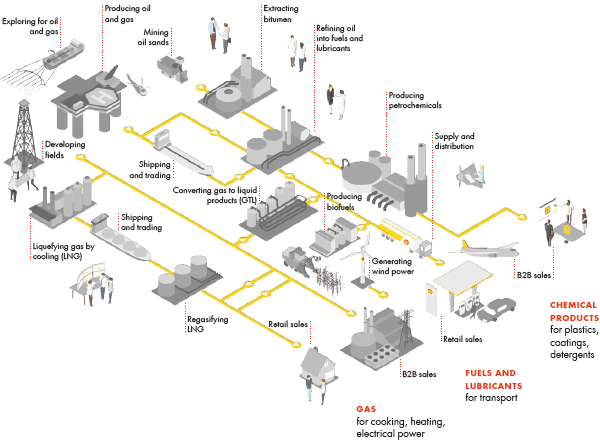 Downstream manages Shell’s refining and marketing activities for oil products and chemicals. These activities are organised into globally managed classes of business, although some are managed regionally or provided through support units. Refining includes manufacturing, supply and shipping of crude oil. Marketing sells a range of products including fuels, lubricants, bitumen and liquefied petroleum gas (LPG) for home, transport and industrial use. Chemicals produces and markets petrochemicals for industrial customers, including the raw materials for plastics, coatings and detergents. Downstream also trades Shell’s flow of hydrocarbons and other energy-related products, supplies the Downstream businesses, governs the marketing and trading of gas and power, and provides shipping services. Additionally, Downstream oversees Shell’s interests in alternative energy (including biofuels but excluding wind) and CO2 management. Projects & Technology manages the delivery of Shell’s major projects and drives the research and innovation to create technology solutions. It provides technical services and technology capability covering both Upstream and Downstream activities. It is also responsible for providing functional leadership across Shell in the areas of safety and environment, and contracting and procurement.